That’s when you can count on State Farm . Bus: 701-746-0495 2534 sharonopdahl.com 17th Ave. S. • Suite F I know life doesn’t come with a schedule. That’s why Grand Forks, ND 58201 at State Farm you can always 701-746-0495 count on me for whatever sharonopdahl.com you need – 24/7, 365. GET TO A BETTER STATE™. CALL ME TODAY. Everybody loves a parade! In conjunction with the New Year’s Day parades, Tidbits marches along several parade routes, bringing you the info on these processions. •	Ticker-tape parades are a well-known occurrence in New York City. The first such event took place in 1886 and honored the dedication of the Statue of Liberty. Back then, 1-inch strips of paper were used to print stock quotes from the ticker machine. Many of the offices along the Broadway parade route were stock brokers and threw the tape out of their office windows on those below, giving the tradition the name of ticker-tape parade. When the stock ticker was replaced with electronic boards in the 1960s, folks used shredded paper and confetti. trict. Each honoree has a black granite marker embedded in the sidewalk along the route, inscribed with the date and description of the achievement. Astronauts, military personnel, athletes, and political dignitaries are among those who have been honored. Quiz Bits 1. 2. 3. 5. What is “Jeopardy!” host Alex Trebek’s country of birth? 6. What is converted into alcohol Name the puppet who served as during brewing? the Rose Parade’s Grand Mar7. How many members are in the shal in 1996. Mormon Tabernacle Choir? What female pilot was honored 8. What age did comedian Jack twice with NYC ticker-tape Benny always claim to be? parades? 9. Who wrote and released the What football team was honored song “Edge of Seventeen” in as Super Bowl Champions with 1982? parades in 2008 and 2012? TRIVIA What is a group of bacteria called? PARADES (continued): •	Theodore Roosevelt was paraded upon his return from an African safari in 1910, Charles Lindbergh was hailed following his trans-Atlantic flight in 1927, and war generals Eisenhower and Nimitz were celebrated after World War II. Astronaut John Glenn was honored in 1962 and the Apollo 11 astronauts Neil Armstrong, Buzz Aldrin, and Michael Collins were showered with confetti upon their return from the world’s first walk on the moon in 1969. Only one pope has received a New York tickertape parade, Pope John Paul II in 1979. •	Although often associated with athletic success, the first athletes weren’t honored in a ticker-tape parade until 1924, with the return of the Olympic team from the games in Paris, where Johnny Weissmuller won three gold medals in swimming and Harold Osborn was a hero in track and field. Since then, several Olympic teams have been heralded, as well as the New York Yankees, the World Series Champions seven times, the New York Mets as Series winners in 1969, and the New York Giants football team. In 1957, Wimbledon Champion Althea Gibson, the first person of color to win in professional tennis, was paraded and remains the only tennis player to be honored as such. Contact us to learn about promotions on other properties, too. 4. In 2014, Dallas running back DeMarco Murray set an NFL record for 1. The first major-league regular-season game played consecutive 100-yard rushing games to start a outside the U.S., in 1969, season (eight). Who had featured the Montreal Exheld the mark? pos and which team? 2. Who was the first Big 12 5. T or F: The Detroit Red men’s basketball team other Wings have won the Stanley Cup with a Game than Kansas to win the Seven OT goal twice. conference tournament? 3. What was the most recent 6. Name the only two NHL players to win the Hart of the 17 Grand Slam Trophy (MVP) with more singles titles won by Roger than one team. Federer? KEEP WARM WITH AN AUTO START Call or Stop By Today to Schedule Your Auto Start Installation! and a tug-of-war contest. In 1902, the parade was followed by a football game for the first time, considered the first “Rose Bowl.” However, football games post-parade have only been an annual event since 1916. Today’s Rose Parade route is 5.5 miles long and includes marching bands, horse units, and flower-covered floats. Famous parade Grand Marshals have included Dwight D. Eisenhower, Bob Hope, Richard Nixon, Shirley Temple, Frank Sinatra, and Sandra Day O’Connor. We carry Meyer plows for Residental and Commercial use, and a wide variety of Salt Spreade rs. •	Although the Macy’s Parade has been an Thanksgiving morning fixture since 1924, it wasn’t the first. Gimbel’s, a Philadelphia department store, was ahead of them by four years, sponsoring the first parade in 1920. Macy’s, however, became the one to watch, adding the first of their famous colossal helium balloons in 1927, a giant Felix the Cat. By 1933, more than a million people lined the parade route. As popularity grew, more balloons were added – Mickey Mouse in 1934, Superman in 1939, Popeye in 1957, and Hello Kitty in 1976. Other notable characters include Curious George, Scooby-Doo, Mr. Potato Head, and Snoopy and Woodstock. •	Look out below! On a rainy Thanksgiving in 1957, as Popeye floated above the New York City crowd, his cap filled up with rain, and dumped its contents on parade-goers below. In 1994, the purple Tyrannosaurus Rex Barney veered off course and ran into a lamp post, causing a large tear in his side. Luckily, Barney was the only one injured. Not true three years later, when the Cat in the Hat struck a lamp post, flinging fragments to the street and striking a spectator, resulting in her skull fracture and a month-long coma. •	In 1919, the community of Lodi, California, held a parade honoring soldiers who had returned from World War I. A California entrepreneur named Roy Allen mixed up a formula for root beer he had purchased from an Arizona pharmacist and sold it on a street corner during the parade for a nickel a mug. The beverage was so popular that before long, Allen had expanded to four sites, which eventually evolved into drive-ins. In 1925, he took on one of his employees Frank Wright as a partner and the pair began offering franchises under the name A&W. The company is the oldest franchise restaurant in the country with more than 1,100 locations in 10 countries. •	It was noted 20th-century French-Swiss film director, screenwriter and critic Jean-Luc Godard who made the following sage observation: "A story should have a beginning, a middle and an end, but not necessarily in that order." •	Those who study such things say that Roman emperor Gaius Julius Verus Maximinus was more than 8 feet tall. •	If you live east of the Rocky Mountains, you've probably spent summer evenings watching the flashing green or yellow lights of those beetles we call fireflies. You might be surprised to learn, though, that different species have different colored lights. For instance, the Paraguayan railway beetle can show both green and red lights (like a railway lantern; hence, the name). •	According to the U.S. Census Bureau, there are currently more than 1,500 American residents named "Seven." •	The Taj Mahal, widely known as "the jewel of Muslim art in India," was commissioned in 1632 by the Mughal emperor Shah Jahan, who wanted the tomb of his favorite wife to be housed in splendor. After construction was complete, Jahan wanted to ensure that this architectural wonder would never have a rival, so he had the chief architect and main artisans put to death. The stone masons who had done the best work on the structure had their hands amputated, and the artists responsible for the delicate inlay work were blinded. •	In some parts of colonial America it was illegal to kiss your spouse in public. *** Thought for the Day: "The moment we begin to fear the opinions of others and hesitate to tell the truth that is in us, and from motives of policy are silent when we should speak, the divine floods of light and life no longer flow into our souls." -- Elizabeth Cady Stanton © 2015 King Features Synd., Inc. INCLUDING ALREADY DISCOUNTED ITEMS* *Some exclusions may apply. We reserve the right to limit quantities and correct printing errors. Some items are limited to stock on hand and may not be available at all locations. See store for details. “Because so much is riding on your tires” has been the familiar slogan for Michelin tires since 1985. Here’s the story on the French inventor who brought us the first pneumatic tire. •	Edouard Michelin studied art for ten years and had all intentions of spending his life as a painter in Paris. But at age 28, a family crisis altered his plans and the course of his life. The French family-owned business that manufactured agricultural tools, drive belts, hoses, and bicycle tires was in serious financial difficulties, and in 1888, Edouard abandoned his dream to help save the mismanaged company from ruin. His brother Andre, an architectural engineer, also abandoned his own business to join forces with Edouard. With Andre as the head of marketing and public relations and Edouard in charge of research and production, they set out to keep the business afloat. •	A bicycle with a punctured tire changed everything for the company. It took Michelin four hours to repair the bicycle’s tire, made of reinforced rubber and filled with compressed air. The pneumatics were glued to the rim of the wheel, and it was very time-consuming to glue the tire back on. The Michelin brothers could see that the inflatable tire made for a faster, more comfortable ride and resolved to build a detachable tire with an inner tube that was easily changeable by a cyclist. •	In 1891, the Michelins had their bicycle tire ready for the famous Paris-Brest bicycle race with one of the frontrunners, Charles Terront, riding on Michelin tires. When Terront, France’s first major cycling star, suffered a puncture, he was able to quickly fix the tire himself and went on to win the race. The product was an immediate success. •	The next step was to adapt the tire for use on motor vehicles. At that time, automobiles were equipped with wooden wheels with a metal rim. The Michelins set about trying to convince French carmakers of the advantages of pneumatic tires. Within five years of that famous bicycle race, 300 Paris taxis were equipped with Michelin tires. •	In 1894, the Michelin Tire Company introduced what is now one of the world’s oldest and most recognizable trademarks, the Michelin Man. Named Bibendum, the character designed from stacked tires made his debut at the World’s Fair, the Lyon Exhibition of 1894, where the brothers had a booth. •	There were 52 very discouraged employees when the brothers took over the company, which quickly grew to 500 motivated workers when the bicycle tire became successful. Edouard Michelin knew all of them personally and took an interest in their personal lives and families. That became a little more difficult a few years later when the work force grew to 2,000. By 1922, the Michelin factory employed 20,000 workers. •	Edouard passed away in 1940, but the company continued to break ground in the industry. In 1946, Michelin designed and patented the radial tire. In 1934, the company had purchased the bankrupt Citroen automobile brand, and in 1946, it was the leading automaker in France. All new 1948 Citroen models were fitted with the new radial tires. Four years later, Michelin developed a radial truck tire. Michelin now owns B.F. Goodrich and Uniroyal and is the world’s largest producer of tires. It was not until 2012 that the CEO was not a member of the Michelin family. •	On Jan. 9, 1493, Christopher Columbus, sailing near the Dominican Republic, sees three "mermaids" -- in reality manatees -- and describes the mythical half-female, half-fish creatures as "not half as beautiful as they are painted." •	On Jan. 7, 1785, Jean-Pierre Blanchard and John Jeffries travel from England to France in a gas balloon, becoming the first to cross the English Channel by air. They nearly crashed as their balloon was weighed down by extraneous supplies such as silk-covered oars. •	On Jan. 4, 1847, Samuel Colt rescues his faltering gun company by winning a contract to provide the U.S. government with 1,000 of his .44 caliber revolvers. The heart of Colt's invention was a mechanism that combined a single rifled barrel with a revolving chamber that held five or six shots. •	On Jan. 8, 1867, Congress overrides President Andrew Johnson's veto of a bill granting all adult male citizens of the District of Columbia the right to vote. It was the first law in American history to grant black men the right to vote. •	On Jan. 10, 1946, the first General Assembly of the United Nations convenes in London. Two weeks later it adopted its first resolution, which called for the elimination of weapons of mass destruction. •	On Jan. 5, 1957, in response to the increasingly tense situation in the Middle East, President Dwight Eisenhower delivers a proposal to Congress calling for a more proactive U.S. policy. The "Eisenhower Doctrine" established the Middle East as a Cold War battlefield. •	On Jan. 6, 1994, Olympic hopeful Nancy Kerrigan is attacked at an ice rink two days before the Olympic trials. A man, hired by the ex-husband of skating rival Tonya Harding, clubbed Kerrigan in the leg in an attempt to keep her out of the Olympics. Months later, Kerrigan won the silver medal, while Harding finished eighth. © 2015 King Features Synd., Inc.
• Generally, for every degree you lower your thermostat during heating season, you reduce your energy costs by 3 percent. • Want to include more produce in your diet? Sources say prep is the step that makes it work. Clean, chop, slice and otherwise prepare all your produce choices for the week on the day you shop. When it’s ready and waiting, you’re less likely to skip it in favor of something more convenient (and likely less nutritious). • To save a pot of burning soup, remove from the burner and DO NOT stir. Pour the unburned contents into a new pot, while trying not to disturb the burned-on bottom of the pot. • Deodorize carpets with baking soda: Sprinkle liberally, and leave on overnight. Vacuum in the morning. Be sure carpet is dry before starting. • “On a health kick: Step one is to keep a food and activity diary for a week. You can get an idea of what you eat, what times of the day you are overeating and the areas where you can make improvements. Knowledge is power!” — V.R. in Oregon • Remember that as temperatures drop and layers of clothing increase, children in a car seat need special consideration. Remove heavy coats before strapping in a small child or baby. Winter wear can compress during an accident, and it interferes with the straps. Send your tips to Now Here’s a Tip, 628 Virginia Drive, Orlando, FL 32803. © 2015 King Features Synd., Inc.
Around the World on New Year's Eve Fireworks and the drop of a glittering ball. Toasts and midnight kisses. Music and laughter, dancing and anticipation. For much of America, those are the hallmarks of New Year's Eve. But how do other parts of the world welcome this important day? Well, if you live in Spain, you're just as likely to be munching on grapes, one for each of the 12 strokes of midnight, while making a wish. This custom goes back to 1895, when certain farmers with a surplus of fruit on their hands started a new tradition to get more customers. In Belgium, celebrants mark Sint Sylvester Vooranvond, or Saint Sylvester Eve, not just with champagne toasts, but New Year's missives from children to their parents or godparents on fancy decorated paper, which are then read out loud. Planning on taking down that red and green holiday wreath after the fireworks have stopped? How about hanging an onion in its place? The kremmida is a Greek symbol of rebirth in the coming year, used to wake children on Jan. 1 with a tap on the head. Breaking a pomegranate on the doorstep before entering the house on New Year's Day is another Greek ritual for prosperity and good luck. The Danes also break things on their doorstep -- but dishes, rather than fruit, to ensure many friends in the new year. And a hearty evening meal is topped off with a cone-shaped cake called a Kransegage, decorated with fire and flags. Part of the fun of celebrating on Dec. 31 is looking forward to what the coming months may bring, hence the Finnish tradition of molybdomancy -- telling New Year's fortunes by melting "tin" (lead, actually) on the stove and then quickly throwing it into a bucket of cold water. The metal is then scrutinized by candlelight to see what fate has in store for the seeker. A similar aim is achieved with sprigs of mistletoe in Ireland: Placed under pillowcases by single ladies, the hope is that the plant will draw both luck and a husband. But be wary of the first person to enter your home after the 31st! If it's a tall, dark, handsome fellow, you can relax, but a redheaded female will only bring trouble. Perhaps the past 12 months are something you'd prefer to forget. In such case, a visit to Ecuador may be just the ticket, where you can join in the annual burning of thousands of life-size scarecrows crafted from wood and newspaper. Torched in the streets at midnight on New Year's Eve, they stand in for all the trials and hardships that will hopefully now yield to happier times. Wherever and however you choose to ring out the old and ring in the new this season, here's wishing you a 2016 full of possibility. Salut! (c) 2015 King Features Synd., Inc.
Tick-tock goes the clock, goes the old nursery rhyme. Consider these facts about the history of various types of time-keeping devices. •	The word “clock” has its origins in the French word “cloche,” meaning “bell.” In German, the word is “glocke,” and Latin is “glocio.” •	In 1330, the octagonal bell tower of the San Gottardo Church in Milan, Italy, featured the first public clock. It was one of the first recorded clocks that struck the hours. •	Clocks became more accurate in 1656 with the invention of the pendulum. The weight on the pendulum swung back and forth steadily, and a clockmaker invented a device to count the swings and drive the clock’s hands. •	In 1755, Vacheron & Constantin, the first watch-manufacturing firm, was established in Switzerland, and it has remained in business continuously for 260 years. In 2005, the company manufactured a complex wristwatch for its 250th anniversary that was 18-carat gold with blue sapphire glass. Containing 834 individual parts, only seven Tour de I’lle watches were made, carrying a price tag of $1.54 million. •	Levi Hutchins of Concord, New Hampshire, is credited with the first mechanical alarm clock in 1787. His clock did have one serious drawback – it could only ring at 4:00 AM! A mechanical wind-up alarm clock that could be set for any time was patented by a familiar name, Seth Thomas, in 1876. The Seth Thomas Company began producing clocks in 1813, and that brand can still be purchased today. DIFFERENCES: 1. Bench is missing. 2. Sun is missing. 3. Cap is different. 4. Zipper is missing. 5. Scarf is shorter. 6. Poster is missing. © 2015 King Features Synd., All rights reserved. 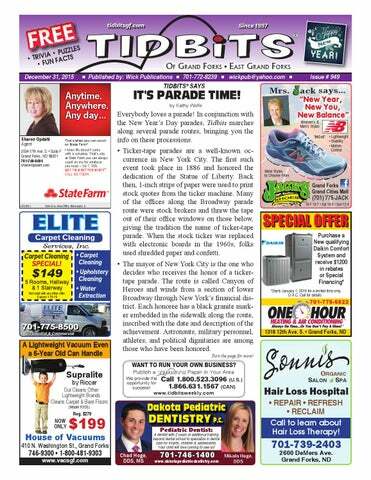 "It's Parade Time," "Michelin" and "Clocks"